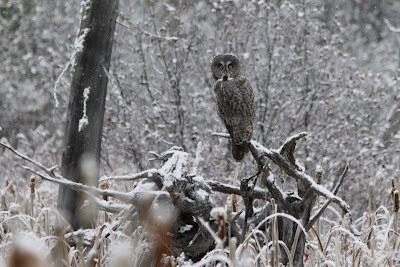 My 200th "lifer" bird, a stunning Great Gray Owl. The alarm went off at 3am on Thanksgiving Monday. Rob and I got up, no complaints, and got ready for Jim and Lynda to pick us up at 4am so we'd be in Algonquin Park for sunrise. 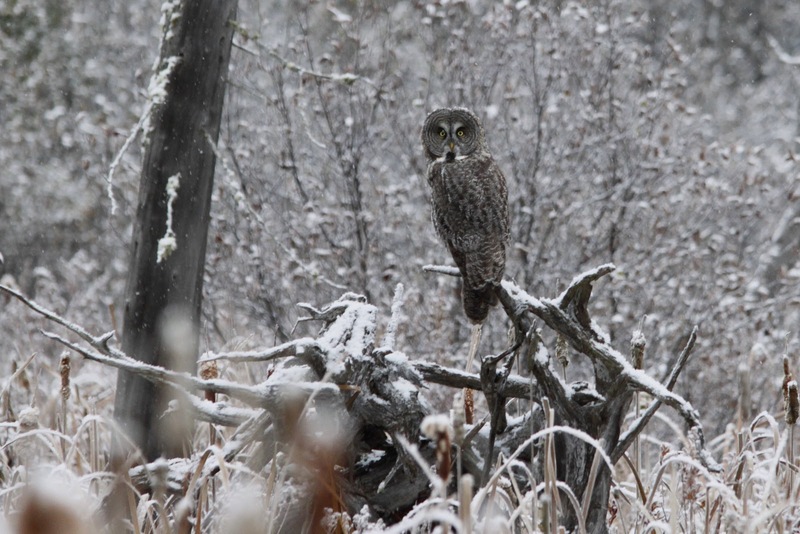 We met Lev as planned and we all (besides Lev) had our first look at a Great Gray Owl in his natural habitat. In February 2011, Rob and I went on our first Authentic Canadian Tours trip, the founder and guide leader, Murray, who we now call friend, told me about a story I "must read". It was on a blog by this "young guy, Lev Frid", who wrote about a family of Great Gray Owls in Algonquin Park. Murray sent me the link to the story; "Days with Great Grays" a day later. I was completely blown away by the story, it had everything I love in a story; it was heartwarming, it had some drama and most of all, a happy ending. This is my favorite part of the story, to read the full story, and I suggest you do, click HERE. How awkward this must've looked - a human and an owl sitting on a log in the middle of the woods, looking at each other like two kids on a playground making friends for the first time. Of course the bird didn't understand the concept of friends or companionship, but I think at that moment that animal realized that I was more than an inanimate object in it's environment. His sibling's screech notified him of his mother's arrival with a vole, and he swiftly took off from his perch and awkwardly made his way out of the bog. And so did I.
I told everyone about this story! I must of read it a hundred times and emailed it to everyone I knew and some people I didn't, including the Canadian Wildlife Federation, telling them they need to publish it. I became an instant fan of Lev Frid for his commitment and dedication to the health and survival of this family of owls. I commented on his story and he sent me an email thanking me for my words. Over time his name would come up once in a while in our birding circles and I soon discovered we had some mutual friends and acquaintances. Eventually we became "Facebook Friends". I've emailed him a couple times with birding questions and tried to make arrangements with him to give Rob and I a guided tour of Algonquin, but our calendars and schedules never quite meshed. Imagine my surprise when a week ago Sunday while having brunch at Milestones with Rob, my BlackBerry buzzes and it's a message from Lev. He knows of a Great Gray in Algonquin and if Rob and I can make it up within the next week or so, please do, he'd like to show us. I was literally bouncing in my seat after reading his message. A day and time were picked and arrangements were made. We all knew driving up there Monday morning that the owl may not be around, but it was a chance we were all willing to take. 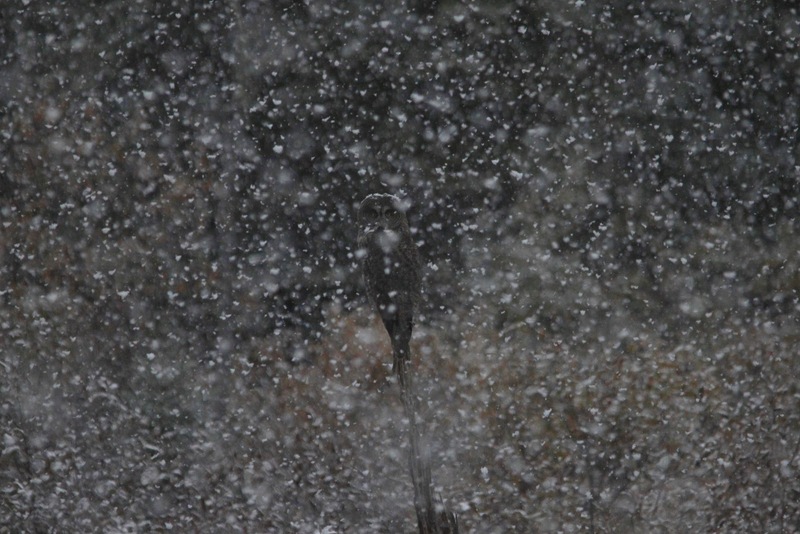 Mother Nature was on our side though, the owl was there and as we entered Algonquin Park the rain that we had been driving through for over an hour suddenly turned into big, white, fluffy snowflakes, but stopped long enough for the guys to take some stunning photos. 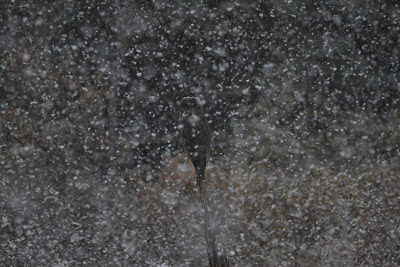 A Great Gray Owl through the snow. What an absolute gift it was to see this majestic creature. 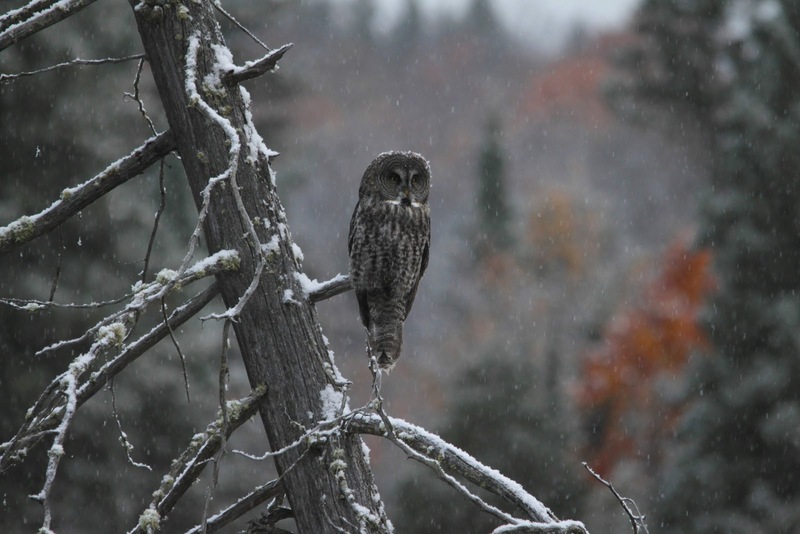 Standing in Algonquin Park with Lev Frid watching a Great Gray Owl was a full circle moment for me and an unforgettable experience for us all. For Lev's new blog, please click here.